The museum is arranged in a way so that viewers can use the art works on display to aid in meditation or deep contemplation if they wish. Specially selected records which also encourage altered states of consciousness are played throughout opening hours. ART WORKS, REPRODUCTIONS, BOOKS, SPACE MUSIC, SHRINE. JB BLUNK, CHRYSANNE STATHACOS, PETER MCDONALD, GOSHKA MACUGA, EMMA KUNZ, ROGER ACKLING, DAVID HOCKNEY, HANS ANDERSSON, MASARU KAWAI, FRANCIS UPRITCHARD, FUMITO URABE, ALEX GREY, MITSUO YUMOTO, YOSHIHIRO WATANABE, ETC. 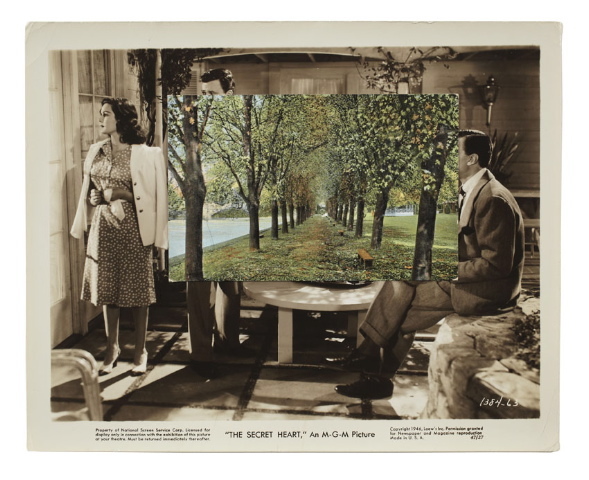 John Stezaker, Untitled (Film Still Collage) XXXIV, 2010. Museum Collection. The Museum of Cosmic Consciousness firstly acknowledges that human beings have experienced intense altered states of consciousness for many thousands of years. It is an integral part of what it means to be human. In 1901 Richard Maurice Bucke, an American psychologist, wrote a book titled ‘Cosmic Consciousness’. This was one of the first attempts to gather these intense experiences together from many different cultures and times. The book includes accounts from religious saints and mystics, but also includes artists and ordinary people. He called these experiences ‘Cosmic Consciousness’, pointing to the trans-personal nature of the experiences that seemed to expand a narrow view of self as ego and re-connect human beings to wider, complex fields of relation. This museum is a very humble attempt to gather visual artifacts that point to Cosmic Consciousness, which people have made through time. One of the guiding narratives in this museum is the tension between experiences of cosmic consciousness as intense personal journeys of seeking and our necessity for the collective (including traditional religious communities like monasteries or the sangha, secular communities like the art world or new collective arrangements like experimental communities). Carl Jung’s idea of the Collective Unconscious provides one important psychological framework to begin to understand this.